Here is sneak peak on what I am working on. 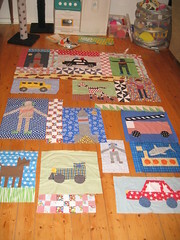 I have the girl version ready for hand quilting and now working on this boy quilt top. The design is from a quilt is courtesy of Kathy at Material Obsession in Hunters Hill. It has been a lot more work than I intended, but I am loving how it is coming together. We move into our new house in two weeks. It has taken over a year for us to get to this point. A lot of blood, sweat and tears has gone into our labor of love. There have been a lot of bumps in the road along the way and sewing, craft and blogging have all suffered this year from lack of time with the house project. I am so grateful I have accomplished the few projects I have this year. Can’t wait to share some photos of the new house when we get there. I am sure I will be the one to break / scratch something first! It will probably continue to be quiet in this space for a few more weeks I fear.